I was thinking about birds today. Perhaps because I saw a flock of tiny birds and it was so cold outside that it made me wonder, as I always do, how they manage to survive the cold with their tiny little bodies. Then I thought of struggles. And life in general. And life as it is today. It brought to mind a poem by a woman who spent her life making block prints and poetry. Her name was Gwen Frostic. I don’t even know the name of the poem, but it brought to mind all of the turmoil in our country and the world. a frog to live his way . . . . When I am away from home there are quite a few things I miss. The fresh, salty air of living in a seaside community. The oft-times starkness of the mountains rising out of the sea. Being able to keep track of the traffic at the airport because more often than not, I hear the planes landing and departing; turbo props, not jets. The background noise of gulls, ravens, eagles, geese, oyster catchers, and a dozen species of ducks. The thrum of boat engines leaving the harbor. 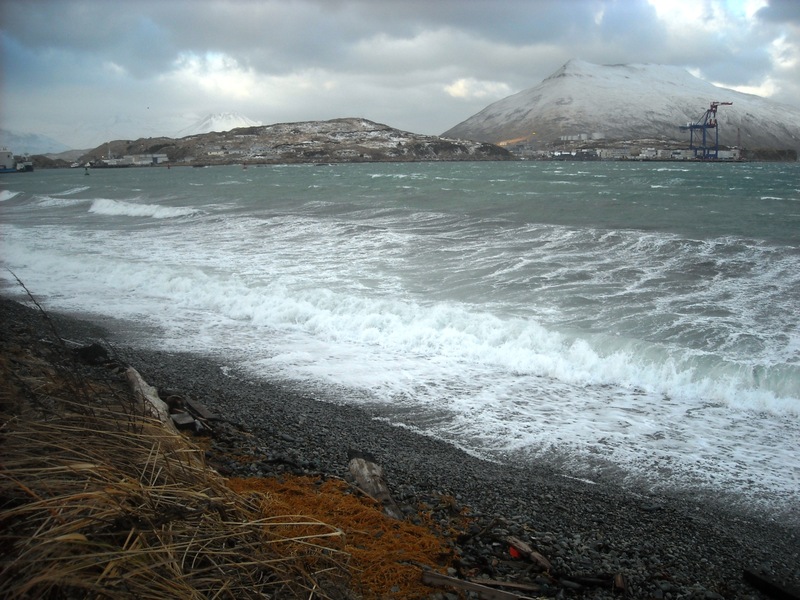 The wild sound of the Aleutian winds. At the top of my list is the constant sound of the ocean. My house sits on a natural spit of land fronted by Iliuliuk Bay which is fed by the Bering Sea. Even on a calm day there is the little slap of waves on the beach. As the seas get bigger, the sound of rolling pebbles and rocks being pulled by departing waves is quite satisfying. But the best is when it is really blowing from the north and the waves are pounding the shore like a big bass drum. That is the time when the waves are so constant and so powerful that they shake the shore and the land, the very air that we breath, and my soul.